Alright folks, it’s that time again for your favorite eclectic, Destroyer, to release a new album! And boy, does he release a new album. Dan Bejar, a veteran whose presence on the music scene has brought us some of the best New Pornographer tracks and eleven previous Destroyer LPs, has recently bestowed ken onto our plebeian ears. As is his style, ken diverges from the previous Poison Season, harkening back to the Kaputt (2011) era instead. This latest Destroyer album delivers a more accessible dosage of Bejar’s signature esotericism, replete with 80’s retro-pop references and less lyrics to wade through than usual. Still, Bejar’s nuanced and complex production style is present in all its glory, and while ken may be more aurally accessible, it definitely takes some attentive listening for those who wish (and, really, who doesn’t?) to finally understand the enigma. Bejar has mentioned in interviews that for this album, as with most of his albums, there is no external agenda he hopes to accomplish; the man is creating music simply because it pleases him. While there are hints of an anti-conformist attitude peppering his prose, it may just well be Bejar fulfilling his duty as a well-known shirker of music societal norms. Take, for example, his frequent, almost habitual use of repetitive lyrical phrases, which normally could be written off as a lazy tic or a blundering attempt to shove a song’s meaning down the listener’s throat. Instead, Bejar takes seemingly banal lines (“I’ve been working on the new Oliver Twist”) and, through repetition, gives them a haunting sense of profoundness that lasts long after the final notes have faded. His instrumentals serve as a vehicle for his lyrics, creating a musical tapestry that pulsates and breathes, as if Bejar has birthed a fully sentient musical thing from a combination of synth and drums. In this reviewer’s opinion, the album is best served as a whole: I have to recommend listening from beginning to end in one fell swoop, and then maybe several times more. 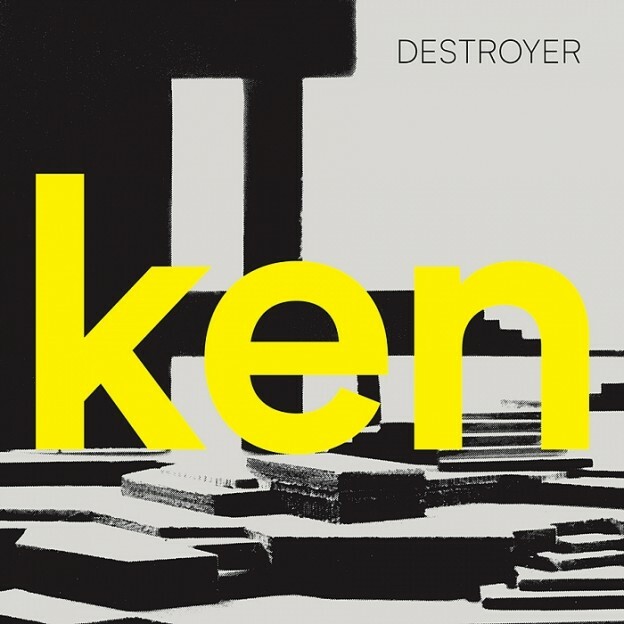 There is a joy of discovery to be had in taking your time with Destroyer’s works, and ken proves to be no different. Of course, some tracks can be lauded individually for their particular prowess. Take the opener, “Sky’s Grey:” it’s an easily-digestible opener, and a good reintroduction for those who may have taken a break from Destroyer. The instrumentals echo the title perfectly, capturing a grey sheet of clouds that cast a somber, brooding pall over the day. Bejar’s vocals here are, as with all of the tracks on ken, the focus. “Tinseltown Swimming in Blood” is the first throwback to the 80’s, with a sharp drumline and, bless, tambourine to provide a snappy syncopation. The saxophone shines here, which is nice, because it is regrettably absent on most of the other tracks. Light synth melodies prepare a pleasant contrast from the darkly self-referential lyrics. “Saw You At the Hospital” is a ballad if I’ve ever heard one, wistful and brooding, with piano and poetic lyrics providing a natural ebb and flow. “A Light Travels Down the Catwalk” features more synth, this time dissonant and powerful to start; Bejar is using something other than his words to grab the listener’s attention. The instrumentals on this track seem to shadow Bejar as he sings, creating a sense of intense urgency that keeps you on your proverbial toes. This entry was posted in Reviews and tagged Canadian artist, Dan Bejar, Destroyer, ken on November 22, 2017 by Juliana Van Amsterdam.